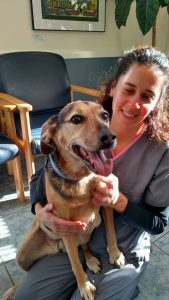 Chelsea was an adorable black and tan beagle mix who was a beloved cancer patient. We were all very inspired by her exceptional journey and the deep bond Chelsea and her dad shared, here is her story. Chelsea was diagnosed with multicentric lymphoma in 2015 and her family pursued multiple rounds of CHOP chemotherapy, single agent therapy (with various drugs for lymphoma) as well as the new therapy Tanovea. The average survival time with this type of lymphoma is one year, Chelsea far surpassed the average and survived 2.5 yrs after diagnosis. Unfortunately, she lost her battle to cancer in March age the wonderful age of 14. In her time here at BEVS while she received chemo treatments (we think she thought of it as day care), she and her dad Craig became near and dear to our hearts. While most dogs diagnosed with lymphoma will not survive as long as Chelsea, they can enjoy a good quality of life even with cancer. Chelsea sailed through her treatments and absolutely LOVED her nurses (especially Michelle). Patients like Chelsea and parents like her dad Craig, are the reason why we dedicate our lives to caring for and treating animals with cancer.